We try to have lots of nutritious snack options available for morning and bedtime snacks — yogurt, clementines, apple slices, bananas, frozen grapes and blueberries, raw veggies, cheese sticks, etc. — but our afternoon snacks are often more fun. 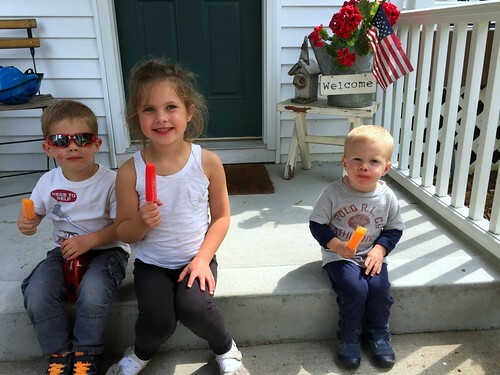 The kids can choose between pretzels, goldfish, animal crackers, vanilla wafers, granola bars, muffins, and sometimes even fruit snacks, candy, or popsicles (in the summer). They LOVE their afternoon snack — especially because we usually let them watch part of a movie or a show on Netflix while they munch away. In an effort to add a few healthier options to our afternoon snack, I’m always on the lookout for super easy snacks that are slightly more nutritious than traditional baked goods or store-bought goodies, kid-friendly, and have a decent shelf/freezer life. Today’s recipe definitley fits all my criteria — which is probably why it’s a favorite in our house! 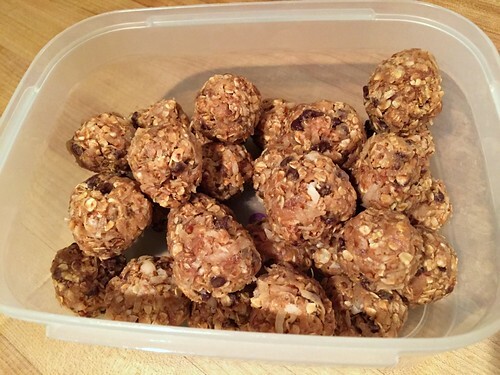 Not only can I make roughly 30 of these yummy no-bake snack balls in 15 minutes or less, they are SO good, and they last for weeks in the fridge (even longer in the freezer). 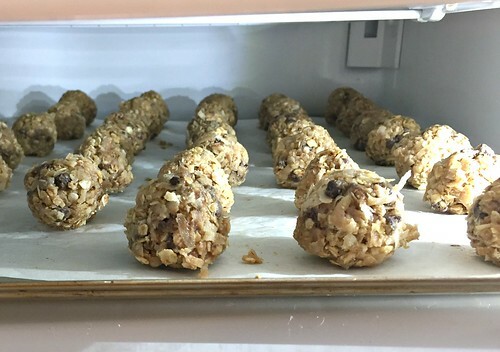 I’ve seen similar recipes called “energy balls” or “healthy granola balls” — but I just call ours “snack balls” because I’m honestly not sure how “healthy” or “energizing” they are. I DO know they are more nutritious than a cookie or brownie, I know my family loves them, and I know they are ridiculously easy to make — so for now, that’s good enough for me! 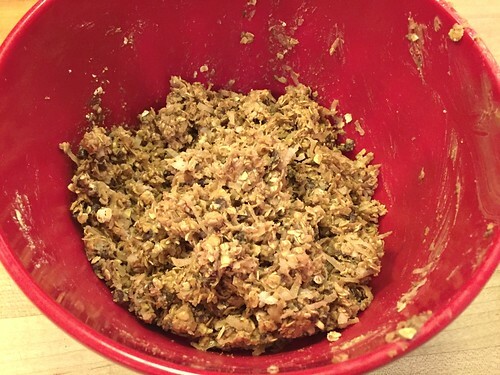 Scoop out a heaping Tablespoon of oat mixture and roll into a ball. 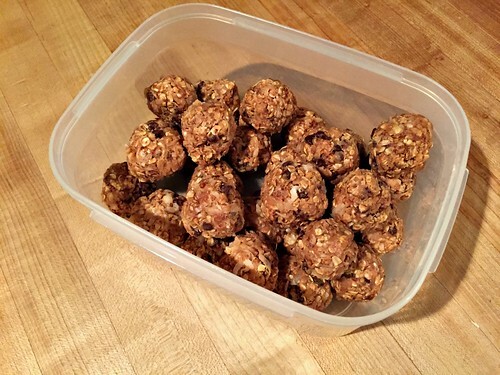 Store balls in a tightly sealed container in the refrigerator, or freeze for later. That’s it! 15 minutes or less and only 1 bowl to wash! 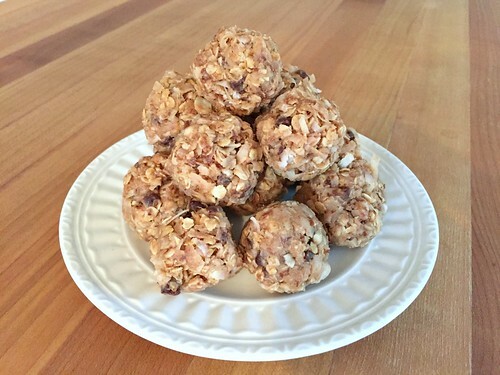 These snack balls are so tasty — just the right amount of sweetness without being too sugary. Also, these are really fun for kids to help with — it’s fairly easy for them to roll the mixture into balls if I scoop out an appropriate amount. 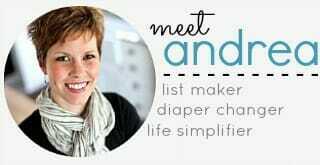 And they love snacking on the little bits that fall while they are rolling. 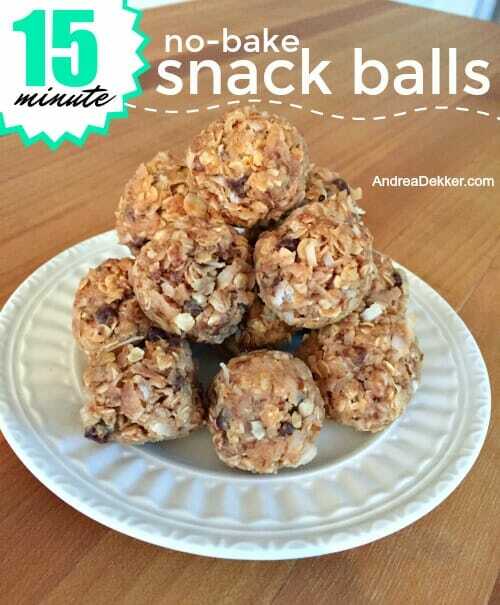 I’m positive there are healthier snack options out there… but considering my kids love these balls, they aren’t pure sugar, and they are super easy to make, they are winners in my book! What are your favorite healthier snack options? Love these! 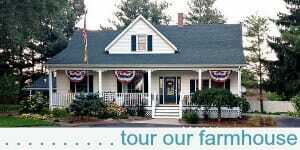 We had friends over right after I made them and they were gobbled up. Thanks for sharing. We’ve made these a few times but yesterday tried something new….we tripled the recipe and pressed into a 9×13 and cut into small squares, bars, etc. I found it easier than rolling into balls. It’s a great recipe! oh yum — great idea! I’ve been meaning to make something like this but was initially overwhelmed by the different recipes available online. Your post was the push I needed and I made them- they’re yummy! well this recipe is super simple — give it a try! I do a version of this for myself on many afternoons! 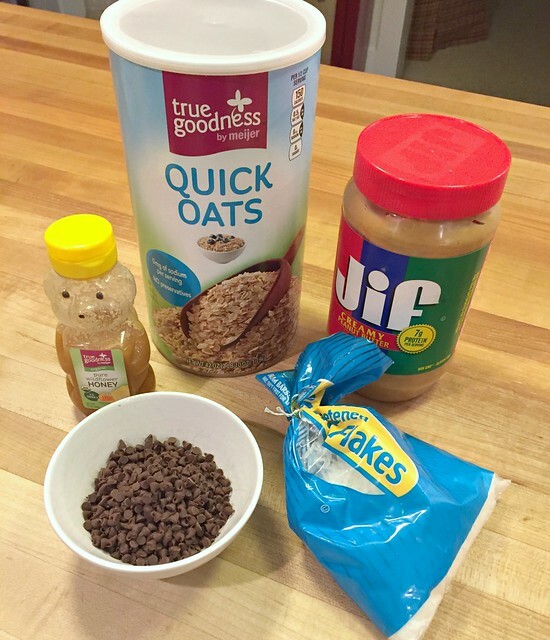 It’s a perfect nursing-mom snack because between the protein, fat, and sugar you feel full and stay full. 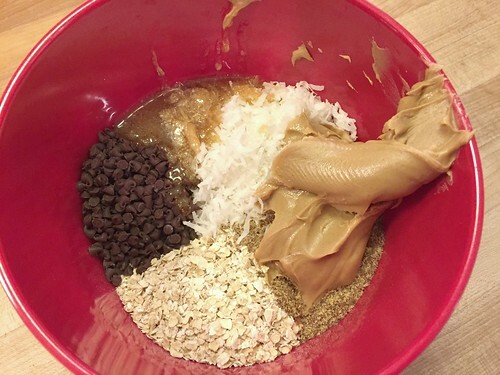 I do a single serving in a bowl, and usually add cocoa for more chocolate flavor. Sometimes I add a little almond flour, for extra protein and it makes everything a bit fudgier. 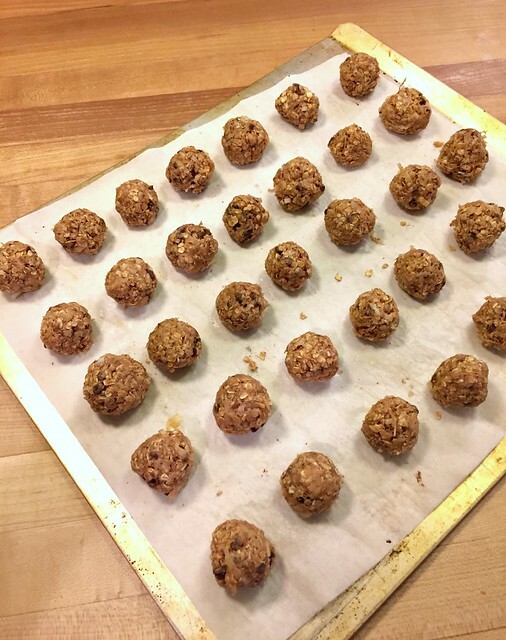 I agree that quick oats work the best–I actually think they’re easier to digest than rolled (when using them “raw” like this) because of how they’ve been processed. (Now if you’re cooking the oats for oatmeal, it’s rolled all the way!) The coconut is a great addition–I’ll have to try that too! Great recipe! I’m definitely trying this one. Slightly off-topic, but I like the way you use screen time in moderation. 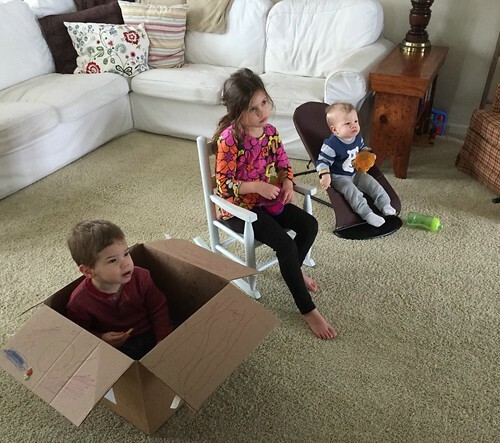 My kids are a bit older, well two of them are, and it seems they are on some type of screens all the time. I like that TV is just a “sometimes” event and you don’t do a lot of other technology. I miss the interaction with them and their interaction with each other. It gets lost when everyone is on their own devices and doing their own thing. However, I will say that they never use the computer or our phones, and Nora is the only one who uses the iPad because she needs to do reading assignments on them for Kindergarten. I’m sure they will be more “addicted” to screens as they get older though! I’m going to make these! We’ve been on the lookout for healthier options that will satisfy an emergency sweet tooth. these are great — definitely sweet enough but not too sweet! 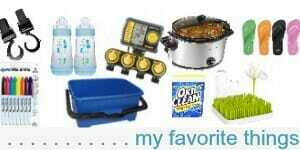 Yes, I love these too!! I don’t always keep coconut in the house but I’ve substituted Rice Krispies and it adds such a fun crunch too! good idea — my kids would probably like them even more with rice krispies! it takes you to the correct recipe, I just had the wrong title on the recipe!! I changed it now!! These look like what I make – I just haven’t incorporated the chocolate chips and I always use the ground flax seed. Easy to make, and easy to pop a couple in the lunch box too! ooo… definitely try the chocolate chips!! Oh…I like that you said lunchbox….I am ALWAYS on the lookout for lunch ideas! Thanks! yes, great lunch additions and easy snacks!